Indian Institute of Tropical Meteorology (IITM) published recruitment notice on their official website. There are 18 vacancies for the posts of Project Scientist ‘D, Project Scientist ‘C’, Junior Scientific Assistant. The details eligibility and application process are given & mentioned below. इंडियन इंस्टिट्यूट ऑफ ट्रॉपिकल मेटियोरोलॉजी (आयआयटीएम) ने त्यांच्या अधिकृत वेबसाइटवर भर्ती नोटिस प्रकाशित केले. आयआयटीएम उष्णकटिबंधीय हिंद महासागरात संशोधन वाढविण्यासाठी पुणे, भारत येथे स्थित एक वैज्ञानिक संस्था आहे. प्रकल्प वैज्ञानिक ‘डी, प्रकल्प वैज्ञानिक’ सी, कनिष्ठ वैज्ञानिक सहाय्यकांच्या पदांसाठी 18 जागा आहेत. या पदासाठी कागदपत्रे सादर करण्याची शेवटची तारीख 28 फेब्रुवारी 2019 आहे. ज्यांना या पोस्टमध्ये रस आहे आणि पात्रता निकषांनुसार त्यांनी त्यांचे फॉर्म सादर करावेत. तपशील पात्रता आणि अर्जाची प्रक्रिया खाली दिली आहे आणि खाली नमूद केली आहे. 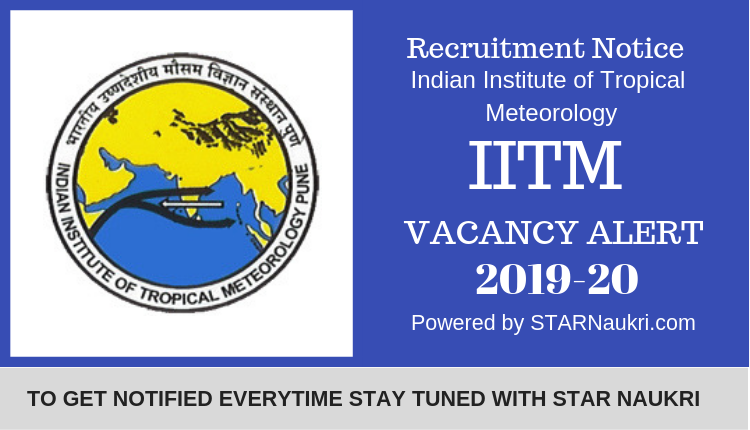 Indian Institute of Tropical Meteorology (IITM) published recruitment notice on their official website(www1.tropmet.res.in). IITM is a scientific institution based in Pune, India for expanding research in the tropical Indian Ocean. There are 18 vacancies for the posts of Project Scientist ‘D, Project Scientist ‘C’, Junior Scientific Assistant. The last date for submitting documentation for the post is 28 February 2019. Those who are interested in these posts and according to the eligibility criteria they should submit their forms. The details eligibility and application process are given & mentioned below.